Do you want to build a kitchen with ample storage space? Or do you have a large kitchen, but need inspiration on how to optimise the space? Extendable corner cabinet – corner cupboards are often awkward spaces, but with a space corner cabinet you can have fully extendable drawers that provide a clear vision of all of the drawers contents unlike some corner cupboards! Space tower pantry unit – If you want a pantry unit that offers plenty of storage space, whose inner pull-outs can be designed individually and that gives you easy access to items from all three sides, then a space tower design will be perfect for your desired function and accessibility. This is the most convenient way to store food and get the most out of your kitchen storage. Pull out base drawers – base cabinet drawers are typically the largest cabinets in a kitchen so why not design them with full extension pull outs that allow you access the entire draw and see everything that is in them. Draw dividing systems – optimise your kitchen storage with drawers that have dividers in them to help you keep organised and fit as much in them as possible. Kitchen island – The kitchen island can provide quite a bit of storage. Use this space to keep the things you usually need when you’re cooking, such as your favorite pots and pans, some utensils and dinnerware. Built in counter storage – Use your bench as storage space by having a customised counter that has built-in nooks for keeping utensils, a place to drain fruits and vegetables after you wash them in the sink and even a cutting board that fits just right between the sink and the cook top. 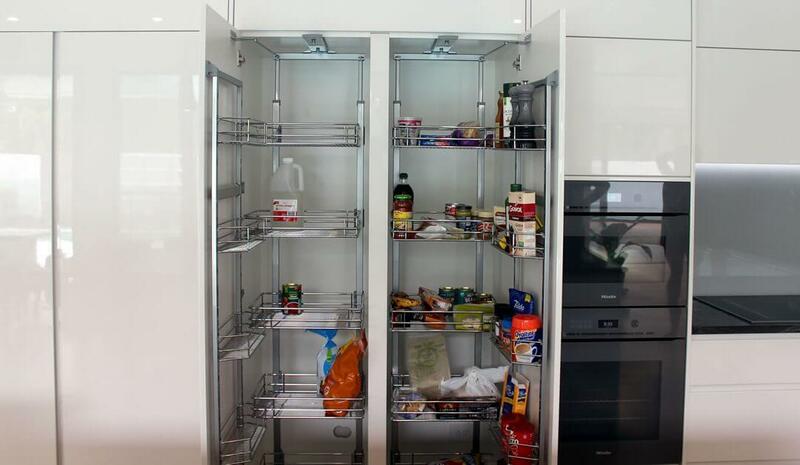 Look Cabinets have the latest options for optimising your pantries storage space! Call us on 07 5472 7272 to discuss our vast storage options and for a FREE kitchen quote!